This is the ideal home for the beachcomber and the nature lover. On the ocean side of Eastham, approx 1.3 miles to Nauset Light Beach and Coast Guard Beach (20-25min. walk or 5 min. drive), near the bike path and ponds. This house has a consistent summer rental income of about $35,000. It has a wonderful open 3 bedroom, 2 bath layout that is perfect for families. Hardwood floors throughout the 1st level and terracotta tile in the kitchen. Upstairs is carpeted. It can be sold fully furnished and accessorized for those seeking a 2nd home or rental property. Check out this listing (more photos, virtual tour) at http://3whidahlane.robertsheldon.com/. This is a short sale. Listed at $399,900. As the cold weather sets in, the sea turtles that didn't head south early enough to escape the cold often come ashore on the Bay beaches of Eastham & Wellfleet where they, hopefully, are rescued. This past weekend over 20 turtles were found on local beaches. The turtles include the rare Kemp Ridley and loggerhead species. 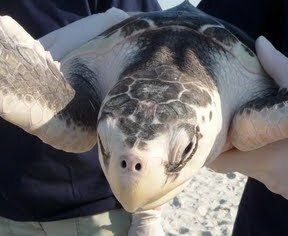 The Kemp Ridley is listed as an endangered species. Check out the story in the Cape Cod Times.... Here. 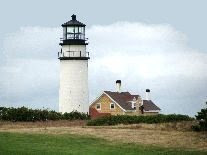 The lighthouse on Monomoy Island has been off limits to overnight stays for a few years, due to the current state of disrepair. That situation looks to be coming to an end due to $1.5M in repairs that are slated for the lighthouse, thanks to the American Recovery and Reinvestment Act. Check out the story in the Cape Codder. Monomoy Island, which, in truth, is an island now, a peninsula later - due to the shifting sands south of Chatham. The lighthouse sits in the middle of a bird and wildlife sanctuary is the temporary home of many migrating birds and sea mammals. It's not uncommon to see hundreds of Grey seals lounging on the beaches of Monomoy. Learn more about the Monomoy National Wildlife Refuge ... Here. It's kinda fun to know that a tradition as American as Thanksgiving had it's beginnings near the place I call home. Weather permitting, I'm sure that I'll visit First Encounter Beach, where the Pilgrims first 'encountered' the Native Americans, sometime during Thanksgiving weekend. This year we expect to have a house-full (including the 5 month old twin grand-daughters) for a traditional turkey dinner (and pumpkin pie!). The first Thanksgiving, where the colonists and Wampanoag Indians shared an autumn harvest feast, was held in 1621 in Plymouth. It's likely that lobster was a part of the first Thanksgiving. Sounds good to me - but how do you make gravy? 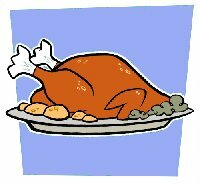 Read about that first Thanksgiving on the History Channel website. I almost missed it. 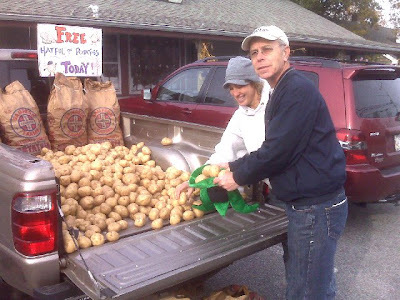 Today is the 15th Annual Hatful of Potatoes Day at the Bird Watcher's General Store in Orleans. It's scheduled each year the Saturday before Thanksgiving. This year the potatoes were in the back of a pickup truck, just waiting for folks, with hats, to show up. No hat - no potatoes. Plenty to go around. I got there at about 1 PM and received mine (see photo, below). Mike O'Connor, owner of Bird Watcher's General Store is a bit of a strange bird. Pun intended. Check out his store...Here. If you look carefully, you'll see that I brought my trick hat. I got this hat at an Irish pub in Torremolinos, Spain, a few years ago on St. Patrick's Day. 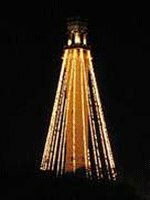 This coming Wednesday evening, November 25th, Thanksgiving eve, will be the annual lighting of Provincetown's Pilgrim Monument. The official lighting ceremony will be from 5 to 7 PM at the monument, followed by refreshments and entertainment. The event will be free to all. The monument is 252 feet tall and sits atop the highest hill in P-Town, bringing the top to an elevation of 350 feet above sea level. The Pilgrim Monument was built between 1907 and 1910 to commemorate the first landing of the Mayflower Pilgrims in Provincetown on November 21, 1620, and was dedicated by President William Taft in 1910. The 100th anniversary of the dedication will be August 5th, 2010. 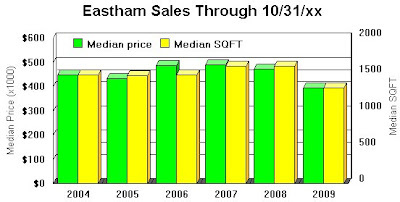 In any discussion of the Eastham marketplace, we can't help but mention that the median price of a single family home in Eastham has dropped significantly since last year. In fact, the 2009 year-to-date (YTD) median price has dropped 16.4% from 2008. I've expounded on the reason for this being a change in the buying pattern, tending toward the low end. I've explained that the data shows a void in the mid-range sales, those in the $450K to $600K range. In fact, there has been a total void in the $500K -$600K range. One of my fellow Realtors, Gary Kersteen, also a retired engineer, did an extensive analysis of the MLS sales data, looking for clues that might help explain the drop in median sales prices. What he discovered provided an insight that had eluded me. He discovered that the median house square-footage for 2009 also down dramatically from 2008. It's down 18.2%. His conclusion is that the prices are down because the size of the homes being sold is down. Q.E.D. An interesting calculation is the $/Sqft number. In 2004 the median sale price divided by the median sqft was $299. In 2009 the same number is $298. You should draw some comfort from this factoid. Take a look at this graph where I've plotted the median sale prices and median home size for the years 2004 through 2009. These prices are YTD through October 31st. Every year students in Massachusetts take a set of standardized tests designed to ensure a high and consistent level of instruction across the state. 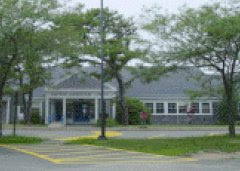 This past spring Eastham Elementary, part of the Nauset School District, did especially well. In fact, they were first overall in the state. The tests are the Massachusetts Comprehensive Assessment System, known as the MCAS tests. Read the Cape Codder article ... Here. My December 2009 Newsletter Is Available Now! 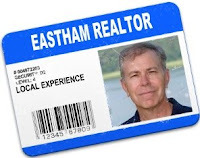 My December 2009 Eastham real estate newsletter is available now! This issue contains my real estate report of sales through October. 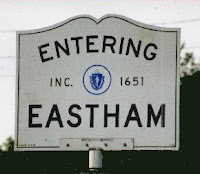 Also in this newsletter are articles about Eastham's 2010 assessments and the new tax credits. Worth a look! Download your copy of the December 2009 newsletter ..Here. A Memorial Bench in honor of Sgt. Mark Vecchione was dedicated today on the Eastham Windmill Green. Mark was killed in Iraq in July of 2006. 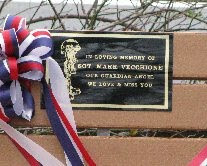 The bench was dedicated in his honor by his mother Cynthia Deslauries, his sister Laurie Vecchione and nephew Sabastian. The dedication was attended by about 40 hardy souls who braved the cold November afternoon. We are forever grateful for his service to our country and promise never to forget the ultimate sacrifice Mark and his family have made. The bench became a reality through the efforts of Dylan De Silva and Cape Cod Cares for the Troops. The Eastham Recreation & Beach Department is having its annual rubber duck race this next Sunday (November 15th) at the end of First Encounter Beach, on Bee's River. Prizes will be 'awarded' to the top 5 finishers. It's a buck a duck and they start swimming at 1 PM - sharp! This should be a lot of fun. If you'd like to buy a duck (for a buck), call the Rec Department at 508-240-5974 after 9 AM this Thursday. When all the ducks are gone, they're gone. This is a rain or shine event. I hope to see you there. To see the Rec Department's flyer, go .. Here. How About A Shoe In The Neighborhood? Appropriately situated on Shoehouse Rd, in Hellam, PA is this boot-shaped house. Shoe store tycoon Mahlon Haines built this unusual home in 1948 to advertise his shoes. The 3 bedroom, 2 bath house features a front door with a stained-glass portrait of the owner himself, an observation platform, and even a shoe-shaped doghouse. At one time the home was a guest house, offering weekend stays to elderly couples. Read about this strange house on 'its' website. Or, take an aerial look at Zillow.com... Here. The 'early' results are in. It looks like October was a fairly 'big' month. The month of October had over $6.2M in sales across 13 sales, compared to just over $500K with 2 sales in the month of September. The $6.2 M is significantly better than any other month in 2009, and the best since September 2008. Is this the beginning of the end of the slowdown? One month's data can't answer that question, but it's a start. The skew of October's sold homes didn't demonstrate that the prior discussion of a bipolar marketplace is not still valid. We'll see. For more details and commentary, subscribe to my monthly newsletter...Here. It's now the law. Congress, and President Obama, have created and signed into law an extension of the first time home buyers tax credit of $8,000. Additionally, the law has provided for existing homeowners to also collect a tax credit of up to $6,500. There are lots of details, income limits, and 'requirements'. Read all about the new laws in CNBC's Investment Guide Special Report. Unfortunately, neither the first time or the existing homeowner tax credits allow for coverage of investment or second home purchases, leaving the Outer Cape real estate market out. Bummer! 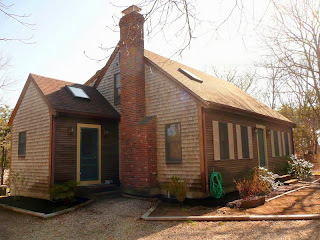 As you've probably guessed, I'm completely fascinated with the architectural style known as Cape Cod Modern. Cape Cod Modern is a style born out of the 50s, 60s, and early 70s by a number of extremely talented architects who just wanted places to escape their 'regular' work environment. The style is characterized by large window spaces, flat roofs, and square-ish layouts. Check out this video for a lot more information and a better understanding of Cape Cod Modern. Also, go to the website of the Cape Cod Modern House Trust. There are 106 'Active' single family residence listings, ranging from $229K to $2.6M. For more details and commentary, subscribe to my monthly newsletter...Here. When I saw this video from the Cape Cod Times I did a bit of research and was surprised by the extent that hang gliding is done on the Outer Cape. It's best done where the high dunes meet the open water. The two locales that seem to host the gliders are in Truro (Bayside) and in Wellfleet (Oceanside). Both have similarly shaped water-facing high dunes. In Truro they go off a platform at the Seascape Motor Inn. The Wellfleet location is at White Crest Beach. The Boston NPR station, WBUR, did a story on Wellfleet's Oysterfest and the oyster shuck-off contest, held every year. For those brave few who attended the contest in the cold pouring rain, they were treated to shucking at its best. Check out the story on WBUR's website and don't miss the slideshow and the video.